Shane Maloney is the award-winning author of the hugely popular Murray Whelan series of comic thrillers set in Melbourne. Murray Whelan is a lovelorn ALP ministerial adviser who somehow seems to keep getting caught up in murder cases. Two of the books, Stiff and The brush-off have been produced as telemovies with David Wenham in the role of Whelan. Rick Amor has long admired Maloney’s books, enjoying the humour of them. They would periodically see each other at Mario’s Café in Fitzroy and nod to each other. Casting around for an Archibald subject, Maloney came to mind. Amor went to Mario’s and Maloney happened to be there. He agreed to sit for a portrait. 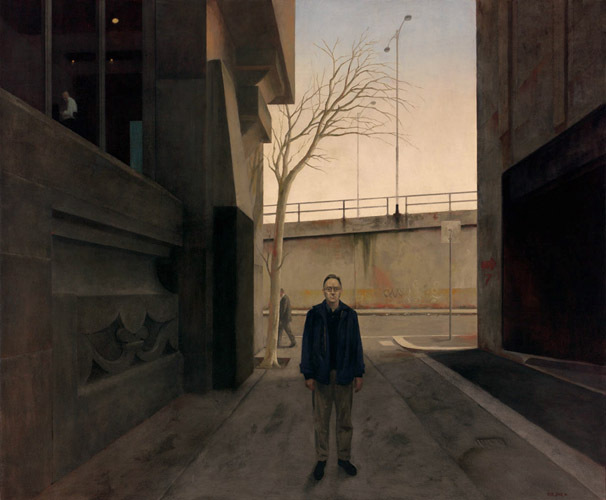 Amor did several sittings for the head, figure and clothes then assembled the portrait putting Maloney into a Melbourne street scene. “I purposely avoided the Archibald big head,” he says with a laugh. Born in Frankston, Victoria in 1948, Amor studied at the National Gallery Art School. In 1968 he received a National Gallery Travelling Scholarship. He has undertaken residences at the Australia Council Visual Arts and Craft Board studios in Barcelona (1991), New York (1996) and London (2000). In 1999 he was Australia’s official war artist in East Timor. He has worked as a full-time artist from 1972 and has exhibited annually since 1983. His work has been hung in numerous exhibitions including the Archibald, Wynne and Sulman Prizes on a number of occasions. He is represented in public and private collections throughout Australia. Co-incidentally, the television adaptation of Maloney’s art world-themed crime novel 'The brush off’ – starring David Wenham, subject of Adam Cullen’s 2000 Archibald Prize winner – was being broadcast on subscription television just as the prizes were being announced on 29 April 2005.